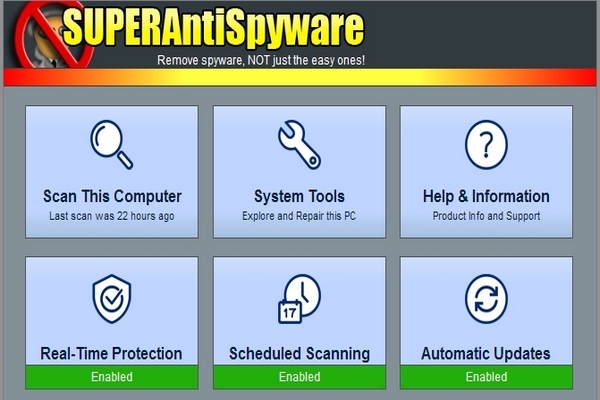 SUPERAntiSpyware will detect and remove thousands of Spyware, Adware, Malware, Trojans, KeyLoggers, Dialers, Hi-Jackers, and Worms.It features many unique and powerful technologies. Moreover it removes spyware threats that other applications fail to remove.The Multi-Dimensional Scanning and Process Interrogation Technology will detect spyware other products miss. Easily remove pests such as WinFixer, SpyAxe, SpyFalcon, and thousands more.SUPERAntiSpyware Professional includes Real-Time Blocking of threats, Scheduled Scanning, and Free Unlimited Customer Service via e-mail.Also includes a Repair feature. That allows you to restore various settings which are often changed by malware programs, but usually not corrected by simply removing the parasite. -- SUPER AntiSpyware screenshotQuick, Complete and Custom Scanning of Hard Drives, Removable Drives, Memory, Registry, Individual Folders and More! Includes Trusting Items and Excluding Folders for complete customization of scanning! -- Detect and Remove Spyware, Adware, Malware, Trojans, Dialers, Worms, KeyLoggers, HiJackers and many other types of threats. -- Light on System Resources and won�t slow down your computer. Also it won�t conflict with your existing anti-spyware or anti-virus solution! -- Repair broken Internet Connections, Desktops, Registry Editing and more with an unique Repair System! -- Real-Time Blocking of threats! Prevent potentially harmful software from installing or re-installing! -- Multi-Dimensional Scanning detects existing threats. As well as threats of the future by analyzing threat characteristics in addition to code patterns. -- First Chance Prevention examines over 50 critical points of your system each time your system starts up and shuts down. In this way it eliminates threats before they have a chance to infect and infiltrate your system. -- Process Interrogation Technology detects threats no matter where they are hiding on your system. -- Schedule either Quick, Complete or Custom Scans Daily or Weekly to ensure your computer is free from harmful software. -- Dedicated Threat Research Team scours the web for new threats and provides daily definition updates.